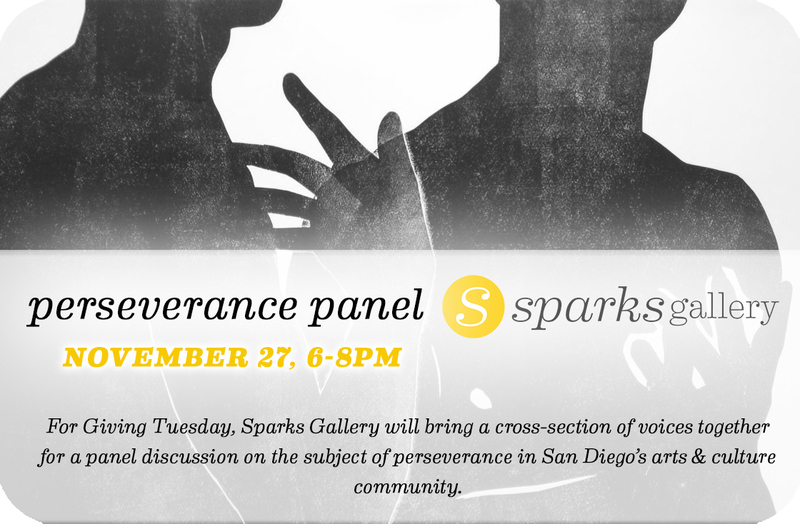 For Giving Tuesday, Sparks Gallery will bring a cross-section of voices who represent a multiplicity of experiences together for a panel discussion on the subject of perseverance in San Diego’s arts & culture community. Leaders from unique disciplines will come together to share their insights in a wide ranging conversation. Sparks Gallery owner & curator Sonya Sparks will host as well as participate in the panel. Sonya will be joined by Lynn Susholz, citizen artist and Executive Director of Art Produce, Jennifer de Poyen Executive Director of Space 4 Art, and Museum of Contemporary Art San Diego’s Co-Curator Anthony Graham. Each panel participant represents organizations at important inflection points — the Museum of Contemporary Art San Diego with their in-progress expansion, Sparks Gallery on the precipice of celebrating its fourth year, Lynn Susholz as she strives to pilot a new public arts initiative in North Park, and Space 4 Art as they fundraise to build their future home. Panelists will share how they are all moving forward — collectively and independently — and what the future can hold for the arts in San Diego, resulting in a sharing of ideas that will empower people to feel a sense of agency in leading the arts and culture community forward.